Grapefruit's fresh, citrusy, invigorating aroma is sure to uplift the mood and please the senses thereby providing peace and happiness to your mind. Known for its energizing and invigorating effect, Grapefruit oil helps to reduce spiritual and physical fatigue when inhaled. Definitely you have got a reason to choose this oil for its purging and purifying benefits. When applied topically, Grapefruit removes excess oil, dirt and also other impurities without peeling off your skins moisture content thus helps to prevent acne. Since the essential oils are highly concentrated, be cautious to blend well 2 drops of oil with 10ml of any carrier oil before apply to the skin. We recommend you to dilute with Ancient Living Rose Water for better results. Alternatively, there are other carrier oils like Sesame, Jojoba or Almond. 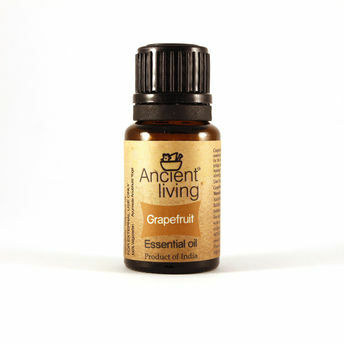 Adding few drops of Grapefruit Essential Oil during bath will make your skin healthy and glowing.